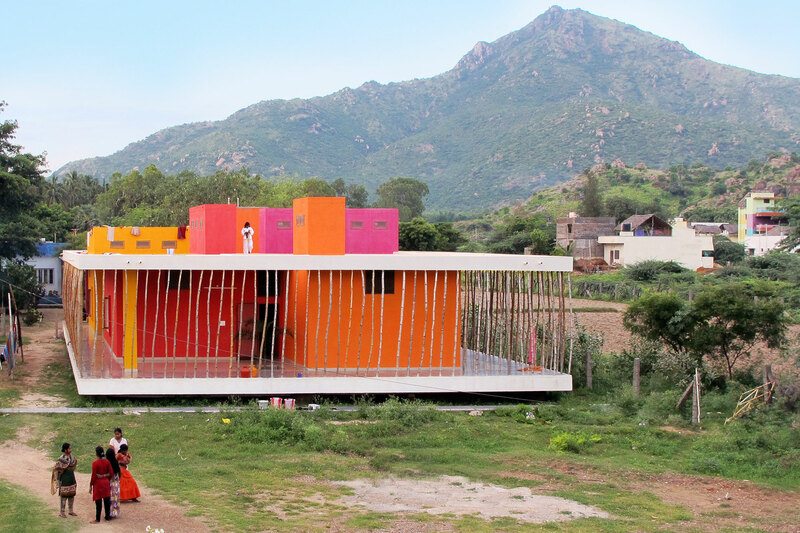 A unity of unassuming mediations, forms and experiences, Casa Rana is a foster home for HIV-positive children in Tiruvannamalai, Tamil Nadu – an expression of the purposeful and paracentric intentions of Italy-based Made in Earth ONLUS. The form sits low; an intriguing image occupied by several fleeting instances: colourful volumes interrupted by intricate textural pattern of bamboo inset within speciously unmoored solid planes anchored readily amidst patches of shrubs. An assembly of these fragmented scales, the structure is raw, compact and porous acknowledging the light, its users’ desires and the site. 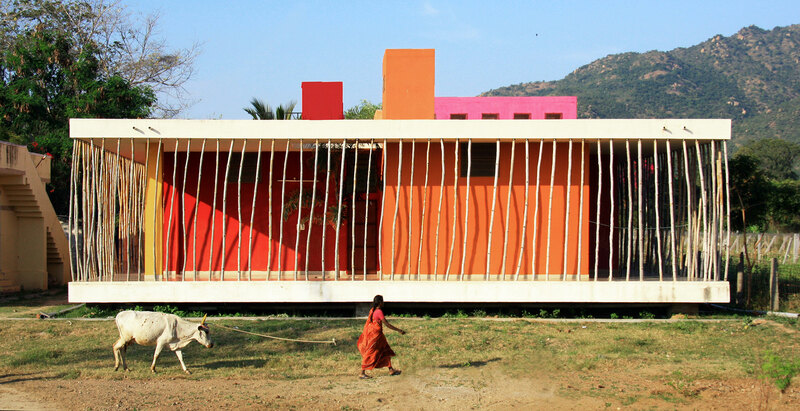 Above all, it stands at the intersection of architecture and social impact. 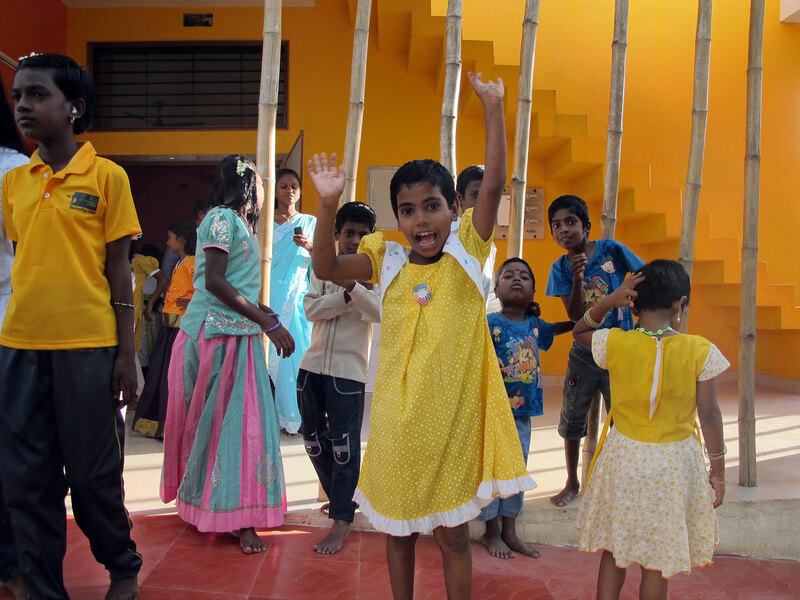 The first of several interconnected Made in Earth ONLUS’s projects, Casa Rana in Tiruvannamalai, Tamil Nadu adapts to their people-centric process and approach to create positive change. “Made in Earth is a non-profit organisation that works on humanitarians projects in developing countries, collaborating with other organizations. […] A fundamental goal for every project, “they mention, “is to combine ethical and aesthetic values in order to protect people dignity, with a real attention to their needs. This way, architecture becomes a chance to pursue bigger goals: this is our idea of sustainability.” A versatile matrix to guide projects of various complexities and scales, they have defined this broader sense of principles and methodologies to characterise their notion of the role design should play in enabling people to effectively achieve the basics of living at an elementary level. And programmatically, this is what Casa Rana adheres to. 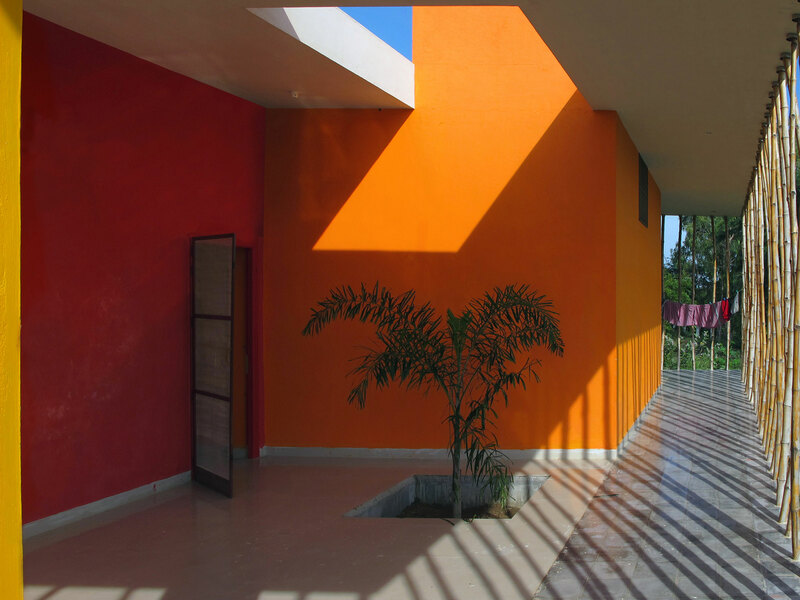 In a non-conformist approach, Casa Rana has been designed as a shelter for around fifteen (‘although sometimes, there are more’) HIV-positive children ‘who are orphans or have been abandoned by their family, or with parents who cannot take care of them’. Extending their sense of belonging – to a family, to a place where they can grow up with other children, was one of the initial premises. “The idea was to create a dynamic, various space for the children. A place that is itself a toy, to be discovered and exploited. A place where children can feel free to gather or to stay alone, that follows them in the many different moments of childhood.” The project was commissioned by one of the patrons of Terres des Hommes Core Trust (TDH). For the architects, the design seemingly explored an architectural idea, but placed value on its residents and is deeply contextual to both; the basic emphasis being function and simplicity. 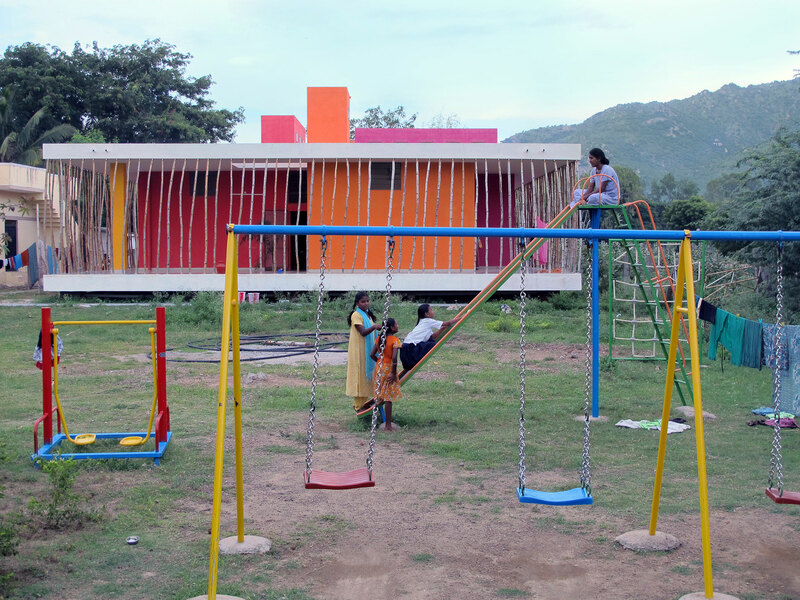 The process involved them being stationed in Tiruvannamalai, and engaging with the TDH‘s staff and the children to identify and prioritise their requirements. Core to the evolution of the process, was viewing the children as participants and not only as end-users. The children were asked to sketch their aspirations of a future home. This steered the tangent of giving them ‘a place full of joy and colour to live.’ The will to humanise the design thus, lends a heightened perspective of the approach adopted by the architects. The further staging of project phases was conventional – with a preliminary concept after the initial discussions, and reworking on it in accordance to the modifications or additional requirements, and implementing it through drawings and renders in collaboration with the local workers. The construct was also be appropriated to counter the predominantly hot climate of the region. The most basic need that a well-intentioned programme can have is flexibility. In a bucolic setting, the design is fundamentally optimistic in its interaction with the site of 1600sqm. A fragmented narrative over 375sqm of built-up area, it is simple in its form, humble yet bold focussing on the context and impact; not on sculptural interventions but consequences. Externally, two monolith concrete planes – an elevated plinth (to avoid floods) and the roof slab – conjoined with a permeable boundary of bamboo stalks unifies the space, both structurally and aesthetically. Detail of the peripheral bamboo wall. Scripted in a textural pattern at the threshold of the plinth and governing a balance between privacy and openness, the bamboo generously allows one to appreciate playful colours of the rhythmic constructs behind. 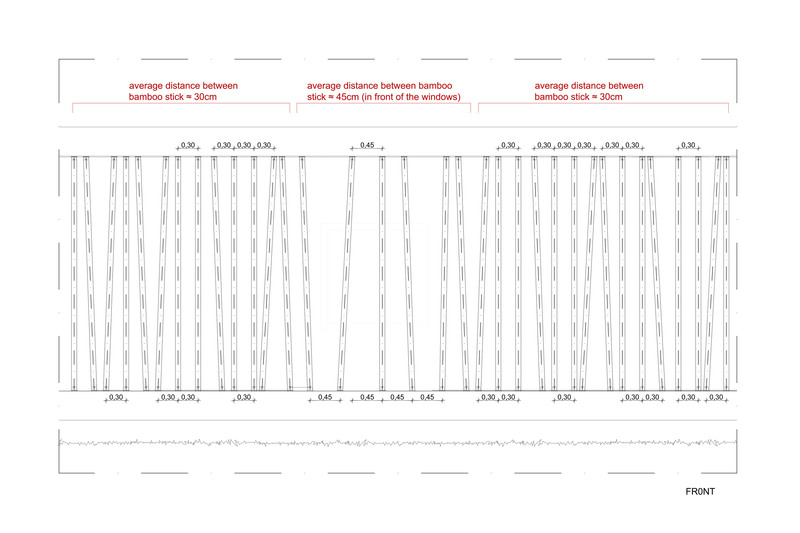 While deploying a sense of enclosure and containment, within a well-articulated distance implemented between bamboo stalks, it allows for a deeper ingress of the sun and responds to the environmental index as a more sustainable alternative to wood (‘owing to its fast-growing peculiarities’). The created chiaroscuro renders the voluminous openings and solids. Beyond aesthetic and sustainable considerations, the bamboo curtain can be valued for its increased idea of accessibility – solely a visually demarcation for the spatial bounds of the shelter. The primal concern seems to be to foster interactions and community through a simple programming of functions. And it is engendered by the place-making and structure of the design. It does not respond to any known lineal rubric of planning. 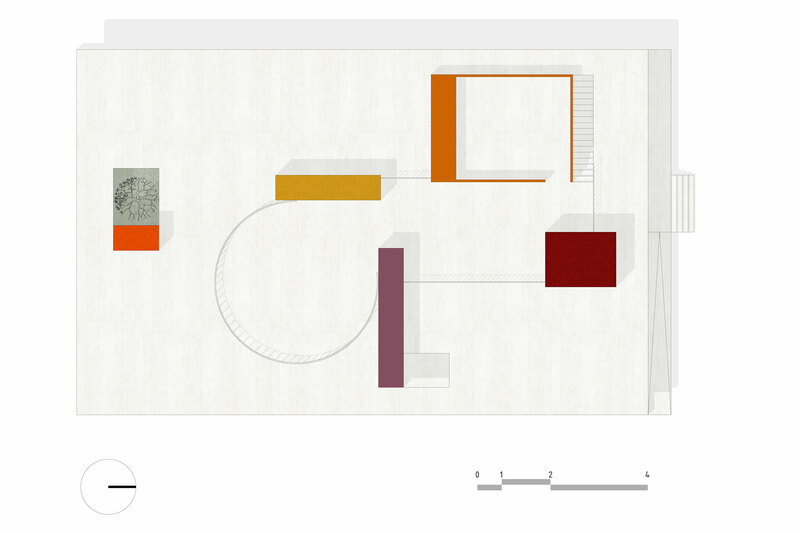 The architecture derives a geometrical fabric of choreographed spaces between broader placements of five volumes. Grounded in these gestures, the building has a highly nuanced contemporary character. A short flight of steps ascends to the northern edge and retreats into a seemingly curated north-south linear axis. The axis emerges as the spatial organiser. In an asymmetrical notion, two structures lie to western side – one comprising of the storage and caretakers’ (fondly referred to as Mummy) room and the other, a dormitory and three volumes – kitchen, a communal semi-open distribution space and two dormitory blocks – towards the east and at the end, is framed a tree. The building works within this whole patchwork, compartmentalising each activity in unexpected ways. The prescribed movement advocates the way of living and subsumes the discrete volumes in a singular composition. Amply lit, the composition is oriented to maximise cross-ventilation, carefully ‘positioned according to the prevailing winds’. The singularity dissolves into a collage of fractals as they intersect and rise above the slab to dexterously accommodate skylights and chimneys for ventilation. The momentary shift ‘completes the overall look of a construction toy’. 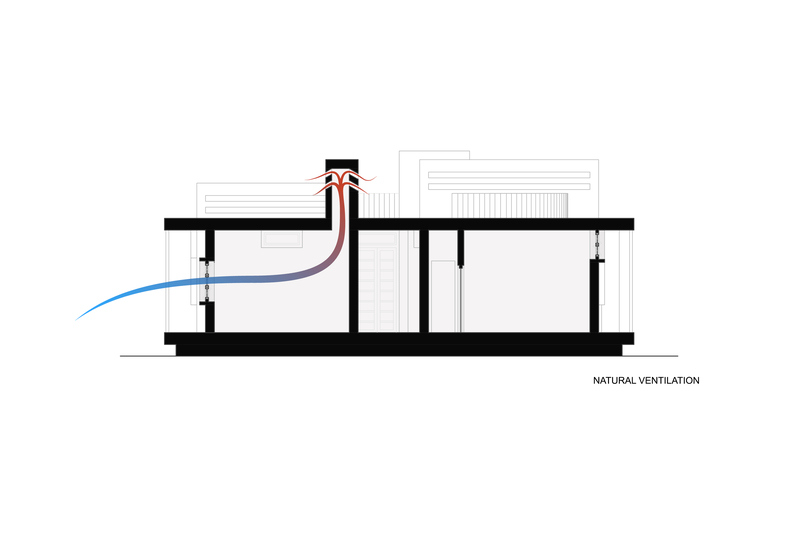 The usable terrace, thus formed, apart from the extrusions, emerges as a conscious layering. The form, the structure, the views, spaces progress through the building in an ineffable way. The visual and tactile encounters are embedded in to contribute to the growing scale of the fabric and its textures and the architects have been frugally selective about the materials. “Structure was made in concrete, realistically the more convenient and rapid material, that also suited the open and airy layout of the project. Walls were made with handmade bricks that ensured good insulation, besides involving local workers and factories. The waterproofing was made using a traditional technique, a mix of broken bricks, sand, water, cement and a liquid that comes from the seeds’ fermentation of a local plant., ” explain the architects. Detailed in a proverbial manner, the design is led in terms of its visual manifestation. The schema of colours draws from the surrounding cultural presence and contributes to its identity – a personal connection to the place and the children. “The bright colours of the walls refers both to the well-known Indian culture of colours and to a big, oversized toy. They also help to give an identity and appropriation feeling to the little inhabitants, ” mention the architects. While it is aptly characteristic in this way, overall the architecture revels in its individuality. 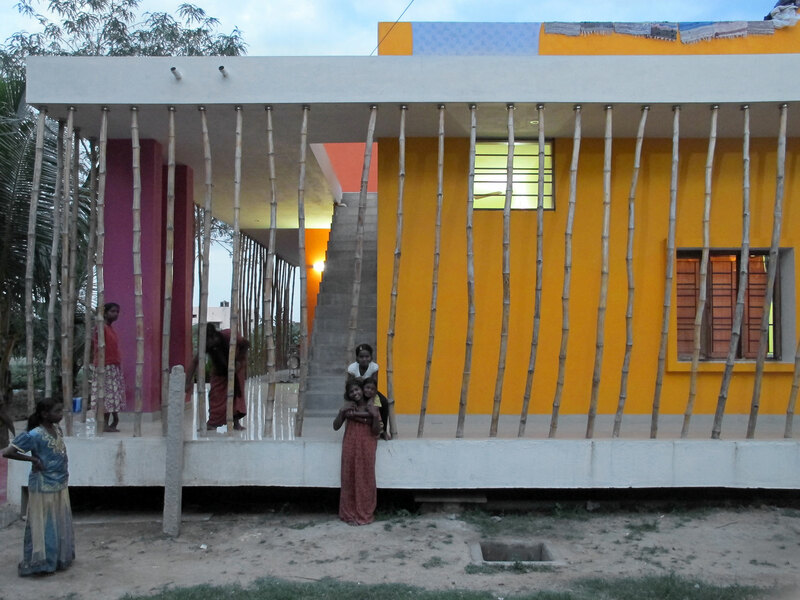 Beyond the provision of a shelter, in this case, architecture also is indicative of a socially-driven dimension. What intensifies this position is the reflection of their ethos as an organisation, generated across the greater proliferation of all the works they do. Elaborating on this, the architects write, “The Casa Rana project is the first one of a network of projects to help this community in need. After that, we planned some other interventions to create a system of buildings in support of TDH: the Paul Institute (a special training centre), the M.A.C. (Music, Art and Cultural Centre) for the community and others children homes”. It is about the children and the staff, and everything that needs to surround them, the bare and the essential. In status quo, the quality of spaces that architects in the general populous create is presumed as the core quintessential value. Is there any other value that we can place – a cause, an ethical framework, a mandate – that guides our practices? 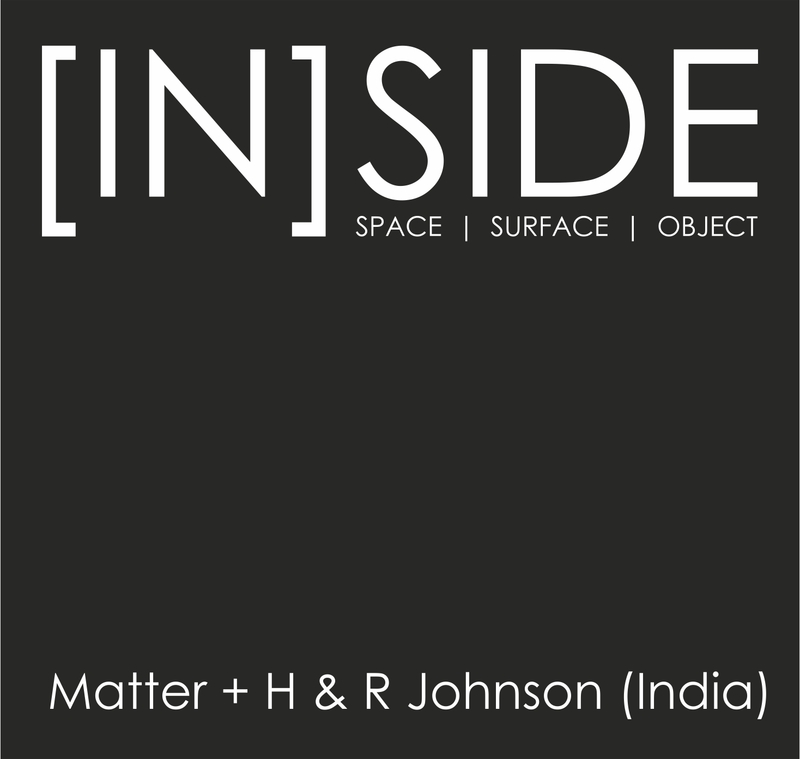 In India, we encounter and assume complex systems, limited resources and intangible socio-cultural aspects which often translate into missed opportunities. 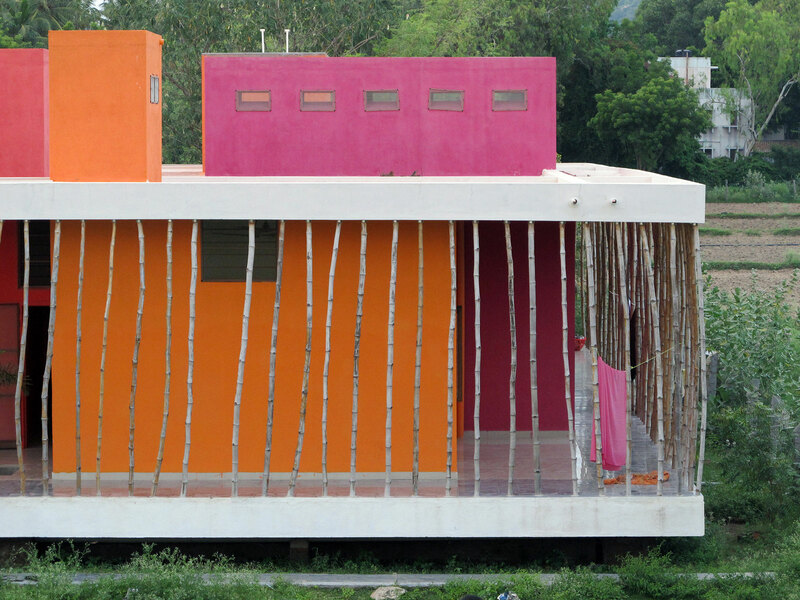 Casa Rana introduces us to this wider discourse where few precedents exist as formal architectural interventions – a precursor by a practice rooted in reality and one that speaks of architecture with a conscience. Consultants: Livio de Santoli, Energia & Ambiente S.r.l.